Cedar Rapids, IA - The Cedar Rapids Kernels, in conjunction with the Minnesota Twins, announce that Brian Dinkelman, Ryan Smith, Virgil Vasquez , and Luis Rodriguez will be the Kernels Field Staff for the 2019 season. Brian Dinkelman takes over as the Kernels manager for 2019 in his fourth season with the Kernels. The previous three seasons, he was the Kernels hitting coach and served as the hitting coach for the GCL Twins in 2015. Dinkelman was selected by the Twins in the eighth round of the 2006 First Year Player Draft out of McKendree University in Lebanon, IL. He played eight seasons in the Twins organization from 2006-2013, including 23 Major League games in 2011, where he hit .301 (22-73) with a double and four RBI. Dinkelman played in the Midwest League for Beloit in 2007, batting .283 with seven HR and 21 RBI in 67 games. He currently resides in Cedar Rapids, IA. Ryan Smith is the Kernels hitting coach for 2019. This is his first season with the Twins organization after three years as an assistant coach at the College of Central Florida where he helped guide the Patriots to a second-place finish in the Mid-Florida Conference. He played two college seasons at Central Florida and finished his college career at Valdosta State (GA) University in 2016. 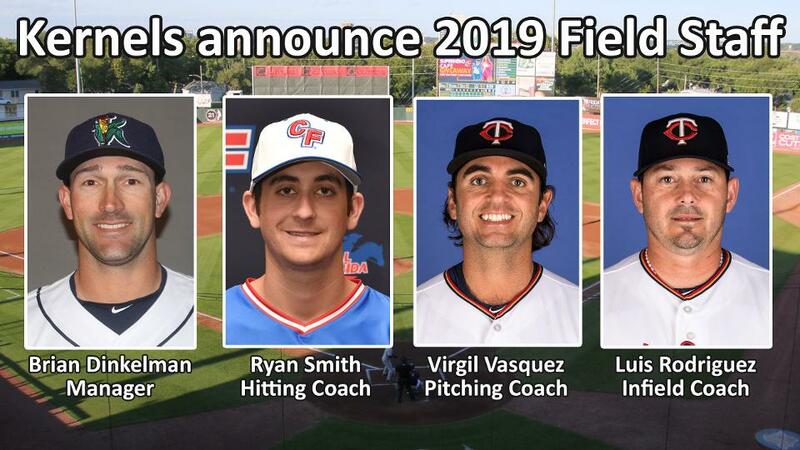 Virgil Vasquez is the Kernels pitching coach for 2019 after being the pitching coach for the GCL Twins the past four seasons. He was selected by the Tigers in the 7th round of the 2003 First Year Player Draft out of UC Santa Barbara and was acquired by the Twins as a minor league free agent in 2012. He spent part of two seasons in the majors with Detroit (2007) and Pittsburgh (2009) going 2-6 with a 6.60 ERA in 19 appearances (10 starts). He pitched 10 seasons in the minors including a 14-6 season with West Michigan in 2004 where he struck out 120 and walked just 34 in 168.1 IP. Luis Rodriguez is the Kernels infield coach for 2019. He's in his second season with the Twins as a coach and was the hitting coach for the GCL Twins in 2018. He played 407 career major league games with the Twins (2005-07), Padres (2008-09) and Mariners (2011), posting a career average of .238 with 10 HR and 80 RBI. He was signed by the Twins as a non-drafted free agent in 1997 and is a native of San Carlos, Venezuela. Tyler Blair will be the Kernels athletic trainer for 2019, after spending last season at Elizabethton. Kyle Kelly will be the Kernels strength & conditioning coach after joining the Twins from Notre Dame. The Kernels begin the 2019 Midwest League season at home vs. Peoria on Thursday, April 4th at 6:35 PM. 2019 Season Ticket Packages, Coupon Books and Gift Certificates are on sale now by calling the Kernels at (319) 363-3887 or online at www.kernels.com. Office hours are 9 AM to 5 PM, Monday through Friday. Individual game tickets go on sale Monday, March 18th at 10 AM. The Kernels are also taking reservations for their Group Outing Areas. For more information, contact Andrea Brommelkamp at 896-7603 or by email at Andrea@kernels.com. A full listing of all group outing areas is available online at www.kernels.com.